To connect the Mac to the Companyweb site, one would think that the simple DNS header of Companyweb in Safari's Address Bar would do it. Safari will not like the locally signed certificate, and pop up a warning every time one navigates to the site. Change both options to "Always Trust". 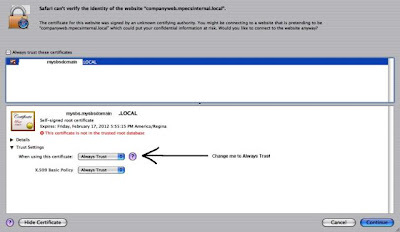 This will eliminate the certificate warning in Safari, and enable the Mac user to browse and work with the Companyweb. Also, the first time the user logs into the site they may need to authenticate against the SBS server. Save the username and password to the Keychain to avoid further password requests until the next password change. Keep in mind that some features of WSS will not be available to the Safari browser such as "Explorer View". It looks as if the Companyweb site, or others in WSS 2.x and the newer WSS 3.x will work very well for a heterogeneous environment with low data volume requirements. Note that WSS 3.x would be the better choice for setting up the shared environment as there are more data redundancy and recovery features built into it like the Recycle Bin. Recovering data for a user from WSS 2.x can be really grief stricken and time consuming. WSS 3.x also has the ability to work a two way relationship with Outlook 2007. That is, changes to the WSS 3.x site can be made in either WSS or Outlook and both will reflect the new changes. WSS 2.x and Outlook 2003 is only a one way relationship. That is, one could only make changes on the WSS 2.x site with those changes reflected in the Outlook window. This would save the need to work with the SMB/CIFS File System Authentication setup (shared folder network access) on every Mac. This point will be clarified further as we delve deeper into integrating our iMac into our SBS based infrastructure. Trouble Installing SharePoint 3.0 after WSUS 3.0. UPDATE: 2007-07-06: I missed that one needs to also check the "Always trust these certificates" under the lock image. However, once that has been done, one no longer gets the certificate not being trusted error, one gets a "Certificate hostname mismatch" error. This one will require more investigation. The error only comes up the first time the user logs into the Mac. Once they accept the certificate mismatch, they won't be nagged about it again until after they have logged out.